Unlike traditional LowE glass, that has 1 coating on 1 glass surface, UltraFlect uses an unparalleled combination of 2 different High Tech reflective coatings with one coating on each piece of glass, and then aligns the coatings to maximize thermal performance and heat reflectivity. On the glass facing the outside of your home, UltraFlect places a coating that is state of the art in reflecting damaging Ultra Violet and heat carrying infrared rays from the sun. 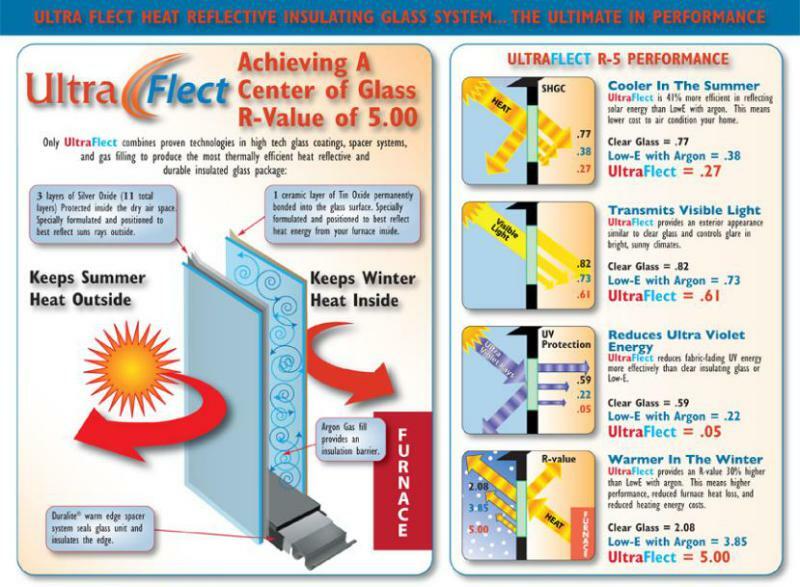 On the glass facing the inside of your home, UltraFlect places a coating that is state of the art in reflecting heat energy from your furnance. This hard coat reflective surface is harder and more durable than glass itself. UltraFlect represents the most dramatic advance in window glass technology in more than 10 years. Only UltraFlect breakthrough technology provides the R-5 performance of triple pane glass with the durability and apperance of dual pane glass. Triple X Heat Shield is onstructed by a high tech process called MSVD in which individual atoms of different metals are deposited on the glass substrate while in a vacuum chamber. 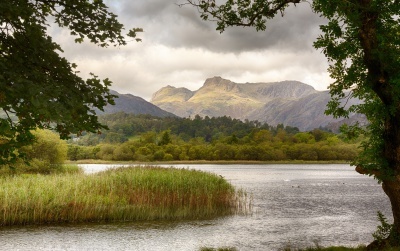 The different layers each serve a purpose, and much of the process is patent protected. The Triple X refers to three layers of Silver, the active ingredients of the coating that actually reflect heat energy. Traditional Low E coatings have 1, or sometimes 2, layers of Silver. Triple X Heat Shield is unique in utilizing a third layer of silver, which multiples the impact of the first two. Triple X Heat Shield requires 4 Anti-Reflective Dielectric layers, composed of Zinc and Tin. The first layer bonds to the glass. All 4 Anti-Reflective layers eliminate distortion and encapsulate each Silver layer, protecting the silver from oxidation, just as more expensive silver jewelry has a coating to prevent tarnishing. On top of each layer of Silver is an added patented Barrier and Hardener layer to provide additional protection to the Silver layer it covers. On top of the entire stack of layers is the patented Titanium Protective Overcoat. Because each layer is built by depositing individual atoms onto the glass, the 11 layers of Triple X Heat Shield are microscopically thin. Triple X Heat Shield is the state of the art in heat reflective technologies. Through creative use of technology, all 11 layers of individual atoms are fine tuned together to provide maximum heat reflection, maximum Ultra Violet reflection, while allowing a maximum amount of visible light to pass through, and doing all this without causing distortion or color tint. How Does it Effect My Energy Bill? The clear apperance of the insulating glass permits 64% of the sun's natural light to enter your home while blocking 72% of its heat energy. That means you can expect a summer cooling cost savings of up to 25% and lower your heating cost by cutting heat loss by nearly 50%. The microscopically thin heat reflective coating blocks solar energy in the summer and reduces the escape of heat in the winter without altering the appearance of your window inside or out.